A little girl who beat cancer twice in her young life is now all grown up, and she's returned to the same hospital where she was treated, this time as a nurse. At 17 months old, Amelia Ballard contracted a 106-degree fever and was referred to Scottish Rite Children’s Hospital, now called Children’s Healthcare of Atlanta. She was quickly diagnosed with acute lymphocytic leukemia. Her 27-month treatment was thought to be successful, but she relapsed soon after. "The cancer during my relapse was extremely aggressive and my course of treatment required intense chemotherapy, cranial radiation, total body radiation and a bone marrow transplant," she told ABC News. "My parents were told that my chances of survival depended on finding a bone marrow donor and my body’s ability to handle all the treatment. My immediate family members were tested and my older brother, Robbie was a perfect match. The intense treatment began in preparation for my body to receive my brother’s stem cells." Despite it all, Amelia and her family kept a hopeful attitude. "My parents decided early on that if I survived, they wanted this to be a positive experience for me, so my mom photographed happy moments and good days during this time," she said. "These pictures would help to encourage me through the bad times and help remind me that that they would pass." In June 1997, Amelia received her brother's stem cells. There were some complications, but in the end, the procedure worked. 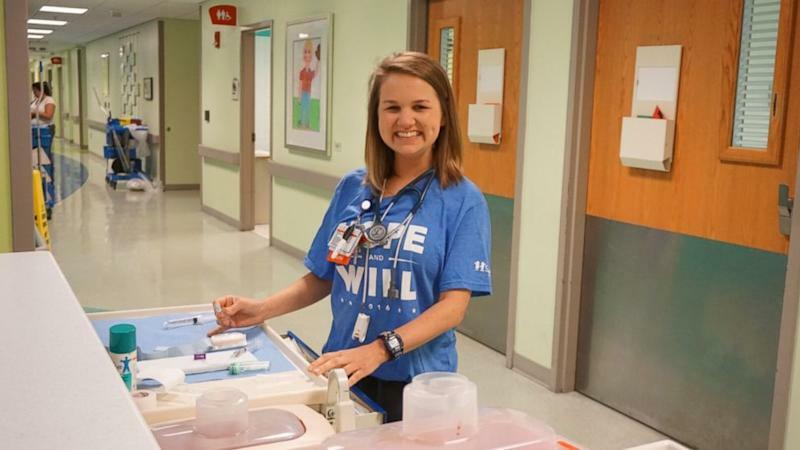 Once she passed the five-year remission mark, she entered the survivor program at the Aflac Cancer & Blood Disorders Center at Children's Healthcare of Atlanta. In May, Ballard graduated from Georgia Southern University’s nursing program and returned to Children’s Healthcare of Atlanta as Amelia Ballard, RN, BSN. "Cancer has been a journey filled with joy, pain, battles and triumphs," she said. "Along my journey, I have lost many dear friends, but I am forever grateful for the journey and the many blessings that have resulted from it. I am so excited to pay it forward and provide each of my patients and their families with the care and compassion shown to me and my family during our experience at CHOA."